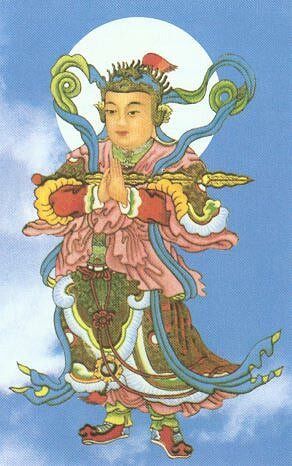 his image is always present in all temples as the `Entry Guardian'. the main images of the temple are instal ed. Nirvana, he instructed the prince to guard the Buddhadharma. bring about a peaceful set lement. His Sanskrit name is Skanda. at turning points of roads so as to afford protection against evil.